With billions of dollars in profits, oil companies can pay a lot of consultants to write a lot of really impressive-looking reports. But look past the fancy cover page and you will often find these documents are nothing more than spin. Case in point: the recent report from Californians for Affordable and Reliable Energy (CARE) and the Valley Industry and Commerce Association (VICA). 1. Californians spend LESS on energy than people in 45 states. The CARE report uses the usual scare tactics about the price of energy. 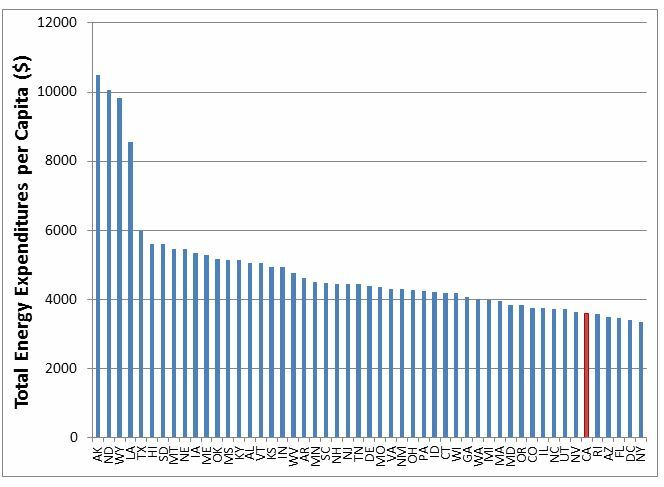 But the truth is that on average, Californians spend less on their energy bills than residents of 45 other states (see graph below) and almost $60 less than the national average per month. This is due to in-large-part to California’s energy efficiency measures, which have led Californians to use almost 45% less electricity per capita than the U.S. average. 2. California’s climate law will yield significant environmental AND economic benefits for its citizens. Not only are the costs of AB 32 policies much smaller than the VICA/CARE report would lead you to believe, California’s climate policies actually yield significant economic and health benefits. Projections show that cap and trade and the Low Carbon Fuel Standard will save $23.1 billion by 2025, including $8.3 billion in avoided public health costs due to the decrease in pollution coming from the transportation sector alone. This also means approximately 900 lives saved and the prevention of 600 heart attacks, 38,000 asthma attacks, and 640 hospitalizations. The dire need for improved air quality is already incredibly apparent in Los Angeles County, ranked the most polluted region in the entire country in terms of ozone pollution, and the third most polluted in terms of year round particle pollution, according to the American Lung Association’s most recent State of the Air report. After a decade of consistent job losses in the manufacturing sector, the state posted manufacturing job gains in 2011, 2012, and 2013, all following the passage of AB 32. In addition, construction is currently leading job growth in California, growing by three percent in 2013, and is projected to continue growing in the next two years. On a state level, California continues to outpace the rest of the nation in terms of job growth, showing that its climate policies are not hurting the Golden State’s economic growth. What may be the most egregious claim from this report is that it wouldn’t be harmful to push back AB 32’s target to 2021 or 2025. Action on climate change cannot wait, a conclusion most recently supported by the White House’s report on the cost of delaying action to stem climate change. The report found that for each decade that we delay policy action, total mitigation costs will increase by approximately 40 percent, and failing to take any action at all would risk substantial economic damage. The effects of climate change are already being felt in California, with less snowfall, reduced snowpack, warmer temperatures, more wildfires, and one of the most severe droughts on record. The need for urgency on climate change is not lost on Californians. A recent survey found that more than six in ten Californians believe the government should take action right away to reduce the state’s greenhouse gas emissions. It is time for the state’s biggest polluters to listen to what Californians have to say and be held accountable for their pollution. The report by CARE and VICA did get one thing right: Los Angeles County has long epitomized the American dream, a place where ideas become reality with hard work and innovative thinking. With this pioneering spirit, Angelenos and Californians have and will continue to embrace the important task of adapting the economy to be more resilient in a world where climate change threatens the health and livelihoods of many. The first step to achieving this is the defense and full implementation of the state’s climate law, AB 32. 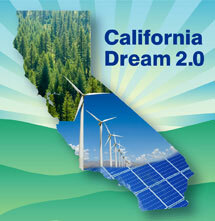 This entry was posted in Cap and trade, Clean Energy, Climate, Global Warming Solutions Act: AB 32, Jobs, Transportation. Bookmark the permalink. Both comments and trackbacks are currently closed.